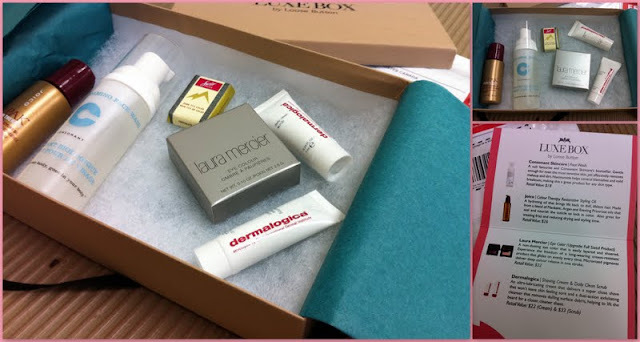 This is my second Luxe Box and this round it showed up right on time (way to go Canada Post for not loosing it again). I really enjoyed last month box, so when they sent me an email explaining a $2 price increase I jumped at the change to sign up for 3 months at the launch price of $10.00. The note thanks me for being a founding member and says there is a little something for Father's Day (awww) and then the list explaining what is inside. So I am totally shocked to get a full sized Laura Mericer eyeshadow. These cost $22 so WOW is all I can say. The other products all look amazing. I can't wait to try out the hair oil. As for the mens items, I doubt my father would use them, and my man has a beard...maybe my father in law would like it. Great box, glad I ordered the 3 months at the old price and very happy with what is in the box. In fact my coworker has seen me open both my boxes and now has signed up herself. They are still wonderful packaged and I loved all the little surprises inside. Last time around some people got a little bonus (full sized China Glaze instead of the sample size) for signing up for 3 months but it seems like that isn't the case this time around, but that is fine (last time was the launch so it makes sense to give someone a little extra during the launch and signing up for 3 months and not for signing up the next month for 3 months). I am still incredibly impressed by this box.